I suppose this isn't quite fair, but I couldn't resist it anyway! Is this how discussions about the curriculum must seem to people outside education? There has been much discussion about the curriculum in general in England recently, and the ICT curriculum in particular. I wrote about the latter a few months ago, in an article entitled 5 Characteristics of an Ideal Programme of Study for ICT. Now, three months and two draft versions of a new ICT Programme of Study later, I should like to put forward a few comments, both about the area of “ICT curriculum” in general, and about recent developments in the UK in particular. 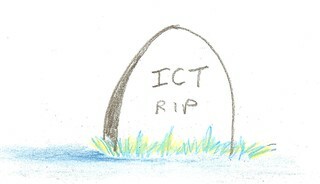 Is the ICT Curriculum Fit for Purpose? 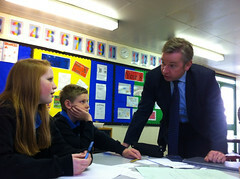 ICT in the ‘old’ National Curriculum as it stands in my opinion is completely unfit for purpose. A curriculum written 10 years ago can in no way reflect the changes in technology and the skills that children need to be taught in the modern world. This is the view of Steve Kirkpatrick, as expressed in an article called The future of ICT in the curriculum? on his excellent Teaching With Technology blog. I have a lot of respect for Mr Kp, as he styles himself, so I went back to basics and had a look at the 1999 Programme of Study, and its updated online version (primary and secondary – Key Stage 3 and Key Stage 4). Sorry, Steve, I have to completely disagree with you. It may not be all flashing lights, so to speak, but that is precisely the point. The Programme of Study, and its associated Level Descriptions, were written in a deliberately technology-free way in order to future-proof it. Indeed, one could argue that the weakest parts are the examples. Even the updated online version, with its example of “multimedia” (as compared with the original “sound” and “graphics”) is starting to curl at the edges as new technology like virtual worlds and, more recently, augmented reality have stumbled into the educational spotlight. The problem is that the the ICT curriculum needs to be developed from the ground up and not from the top down. That’s no problem. The ICT Programme of Study is “vague” enough for any creative bunch of teachers to invent their own ICT curriculum and make it match the Programme of Study. For example, read my Delegation Case Study for information on how I and a group of ICT teachers went about this around 12 years ago. The scheme of work we used, and adapted to our own purposes, not only satisfied the then existing Programme of Study for ICT, it also matched the 1999 rewrite -- and could still be used, with a bit of tweaking, obviously, today. My point is that I have always seen the ICT Programme of Study as enabling rather than restricting. Can we as educators develop a skill based ICT curriculum that is relevant and low cost that will deliver for future learners? Skills-based? Aaaaargh!! What happens when the skills become completely irrelevant (like in about a year, if that)? The only viable curriculum, in my opinion, is one which takes a problem-solving approach, and in which the relevant skills are learnt as needed.